This page contains lens charts for various image sensor sizes used in HD CCTV cameras (AHD, HD-TVI, HD-CVI, HD-SDI) and some network IP cameras. This lens chart can be used by video surveillance installers to help plan what size lens is needed for their application based on the angle of view that the lens will provide. Lens size and image sensor size both impact the angle of view that security cameras provide. HD CCTV cameras (AHD 720p and 1080p resolution) and 1080p TVI cameras typically use one of the following image sensor sizes: 1/2.7", 1/2.8", 1/3" and 1/3.2". Varifocal lenses are more typical than fixed lenses because they allow the installer to adjust the angle of view specifically for their installation. The below list shows the horizontal angle of view that you can expect when your camera has a 1/2.7" image sensor. For example, if your HD security camera has a 1/2.7" image sensor and a 2.8mm lens, it will yield a 114° field of view. The below list shows the horizontal angle of view that you can expect when your camera has a 1/2.8" image sensor. For example, if your HD security camera has a 1/2.8" image sensor and a 2.8mm lens, it will yield a 111° field of view. The below list shows the horizontal angle of view that you can expect when your camera has a 1/3" image sensor. For example, if your HD security camera has a 1/3" image sensor and a 2.8mm lens, it will yield a 109° field of view. The below list shows the horizontal angle of view that you can expect when your camera has a 1/3.2" image sensor. For example, if your HD security camera has a 1/3.2" image sensor and a 2.8mm lens, it will yield a 83° field of view. Below you can find a few sample video surveillance images captured with HD CCTV cameras to give you a visual representation of angle of view. Although we do not have a 1/2.9" image sensor documented above, you can easily calculate an approximate angle of view based on the difference between the 1/2.8" and 1/3". A 1/29" sensor with a 2.8mm lens yields an approximate 103° horizontal field of view. This area of the warehouse is 25 feet wide by 36 feet deep. 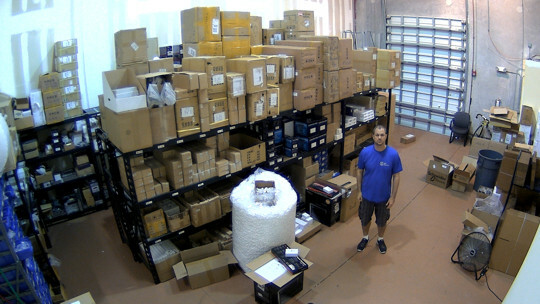 This article was written by Mike Haldas, co-founder and managing partner of CCTV Camera Pros. Questions can be directed to mike@cctvcamerapros.net.